One Fujifilm Xtrans file, two RAW converters. Adobe Lightroom vs Macphun Luminar? Macphun Luminar? How do the two stack up? I shoot Fujifilm cameras for a few years and Adobe Lightroom is my RAW converter of choice. Granted, it has never been too kind to Xtrans files but, it improved over the years. Luminar is a new kid on the block. Macphun recently announced it's a RAW converter called Luminar. I purchased it last year when it was on preorder for discounted price. I played with it a little but not enough to get under its skin. In firs few months of its existence it went through few minor upgrades and bug fixes so I decided to put it to the test. I am not going to do a full review and compare the functionality between the two. Both applications allow you to develop your RAW files. Furthermore, Lightroom's functionality covers the entire photographic workflow. Luminar is a RAW developing tool only. It comes as either standalone application, or as a plug-in for Lightroom or Photoshop. As a plug-in, it works on already demosaiced files on top of Adobe RAW. It can also completely bypass Adobe Raw and take over the RAW conversion altogether. The user can choose. It does create it's own TIFF file which is on exit put back into Lightroom catalog. It is possible to save the file out in Luminar's native format. This file format keeps all the edits and adjustments available for later use. In this case, it is not put back into Lightroom catalog. I picked one image for this short comparison. One contains areas of high-frequency detail and foliage. First, I compared a straight RAW conversion with no other adjustments applied. Then I processed the file in Lightroom and roughly matched the look in Luminar. Nothing scientific is going on here. I am going through my usual workflow and I developed the files as always do. I am interested in is the way the Luminar deals with the file compared to Lightroom. Can I get the same look? Is the Luminar better? Or is it completely useless with Fujifilm Xtrans files? These are few questions I'd love to find an answer for. I also want to point out, that in I share my photographs online and rarely print. Let alone print big. With all this out of the way, let's take look at what we've got. Here is an example of undeveloped RAF file. It has the fair amount of detail, foliage, rust, fine grass. All good subject to examine. I ran the RAF file through both RAW conversion engines. I disabled all other settings as noise, sharpening, lens correction etc. This is the same X-trans file, converted in Luminar but otherwise untouched. The first striking difference is that images seem to have different distortion. When flipping between the two versions, there is a very obvious shift. As if one had lens correction applied and other didn't. There is noticeable are differences in demosaicing. At first glance, they are looking alike, but there are differences. Let's examine some areas side by side. Following examples is 1:1 ratio. Of course the image suffers a bit from jpg compression but still, the differences are visible. Click to open the higher resolution in lightbox. I scaled up the image crops for next comparison. They are displaying the crop at 3:1 ratio. Scaling blurs the image, but the difference between the two is still visible. I processed the image in Lightroom first and then matched the look in Luminar. It is a rough match. If I put more effort into it I could definitely get closer. 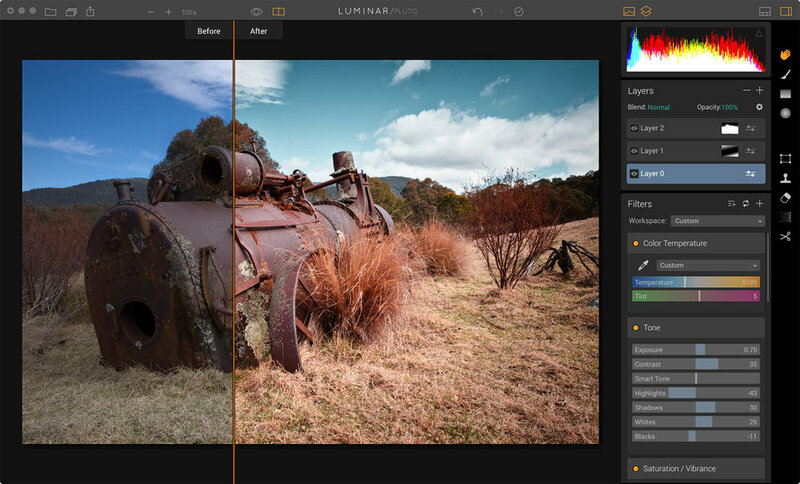 Lightroom has a handy tool that allows comparing two photographs while processing. It is easier to match the look by eye. Luminar lack such a functionality. It always works with a single image. 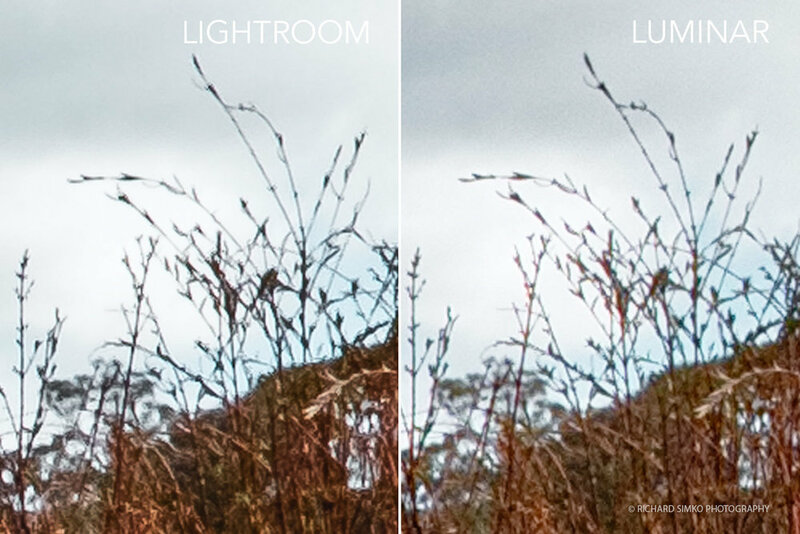 I ended up resizing the Luminar window so I could see the Lightroom version. And I matched the look that way. It's close enough. Why am I doing it this way? Because this is how I work and I want to see what results I get the way I work. When viewed here on the website, it is hard to tell which file comes from Lightroom and which from Luminar. If the Internet is the output destination, any of these two applications will do. For sharpening in Lightroom I used the Peter Bridgwood sharpening method. I sharpened by eye in Luminar. Luminar has few other handy tools to help bring out more detail from the image. We are familiar with the structure, microstructure or detail extractor from other Macphun applications. At this point, I did something that I usually don't do. I am going to pixel peep. These examples are 1:1 crop. As I mentioned, the images are comparable when outputting for online usage. Of course, if we save them in reasonable resolution. Full resolution high-quality digital file for display or print is a different case. I usually judge the sharpening and noise reduction at 100% zoom. This time I zoomed in much more. Of course, it doesn't make too much sense evaluating a single photograph zoomed this much in. However, when comparing two processed files, the differences are quite obvious. Here we go. This is a 400% zoom into the image from Lightroom. I am examining the image for "watercolor" effect, noodles and other funky artifacts. These are the ones that Xtrans files usually suffered from. To me, the file processed in Luminar is a tad sharper and with more details. I do not want to make any conclusions just yet. This is one image only. I want to put few more to the test and see how highlight and shadow recovery works in Luminar. I want to test a file with more green foliage in it. And I also want to test a portrait. The plan is to come up with a follow-up post or even video. I put a bigger variety of files to the test. Have you tried Macphun Luminar yourself? I'd love to hear your experience. I am not associated with Adobe or Macphun in any way. I am paying a member of Creative Cloud and I purchased my copy of Macphun Luminar.